Former state Rep. Stephen LaRoque has apparently fired Joe Cheshire, the Raleigh attorney that represented him during a trial last year that ended in convictions for the former lawmaker. LaRoque, a Kinston Republican who stepped down from the legislature after his federal indictment, was convicted in June of stealing funds from two federally-funded economic development groups he ran. He asked for a new trial after a juror admitted doing outside research during verdict deliberations. 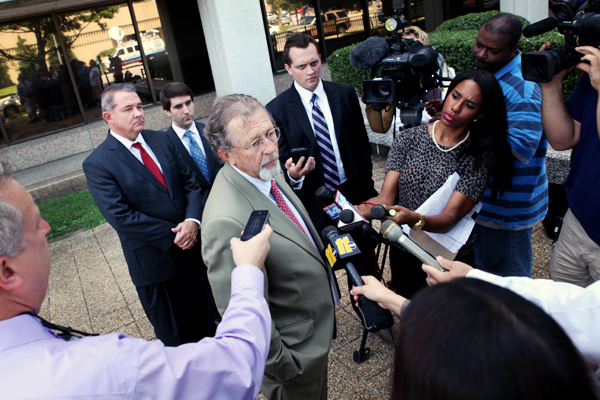 Attorney Joe Cheshire with Stephen LaRoque, left outside a 2012 court hearing. LaRoque told Cheshire, one of the state’s most prominent criminal defense attorneys, he no longer wanted Cheshire to represent him and will instead hire Greenville attorney Keith Williams, Cheshire wrote in the motion. LaRoque is scheduled to be back in court Feb. 13 for a hearing on the motion for a new trial, though it’s unclear if the change in attorneys will affect that date. Though LaRoque was convicted in June of a dozen charges related to the theft of federal funds, he has not been sentenced and could receive a new trial on the basis of juror misconduct. He could also plead to some counts if a new trial is granted and the original criminal charges are reinstated, a possibility alluded to in previous court filings. LaRoque, a one-time member of N.C. House Speaker Thom Tillis’ leadership team, ran two economic development non-profits that got its funding through a U.S. Department of Agriculture program that loaned money to struggling businesses in rural areas. An N.C. Policy Watch 2011 investigation found LaRoque received pay of up to $195,000 a year to run the small non-profits, stacked the non-profit boards with members of his own family, and processed loans to close associates. He was indicted in 2012 and faced further allegations of using $300,000 in federal money to help furnish his expensive lifestyle, buying jewelry and replica Faberge eggs as well as cars and a Greenville skating rink. LaRoque has denied any criminal wrongdoing and said he was owed the money for work he did for the non-profits.